Ernest Crofts was one of the leading military-historical painters of the late Victorian Era, exhibiting over 40 paintings at the Royal Academy. Many of his images portray the events surrounding the Waterloo campaign. He is most known for depicting very detailed and accurate battle scenes. It was this attention to detail that brought the artist to the attention of many art critics. Crofts was elected an Associate of the Royal Academy of Arts in 1878; and in 1896 he was selected to become a full Academician, the only late nineteenth century military artist to achieve this honor. He was also chosen to be keeper and trustee of the Royal Academy, which provided him the privilege of residing at the Academy. In 1901, the king commissioned him to paint a picture of the distribution of the war medals following the Boer War. Two years later he was commissioned to paint a large image depicting the funeral of Queen Victoria. Although Crofts was very popular in 1870s and 1880s, the public lost its appetite for war paintings in the early years of the 20th century. 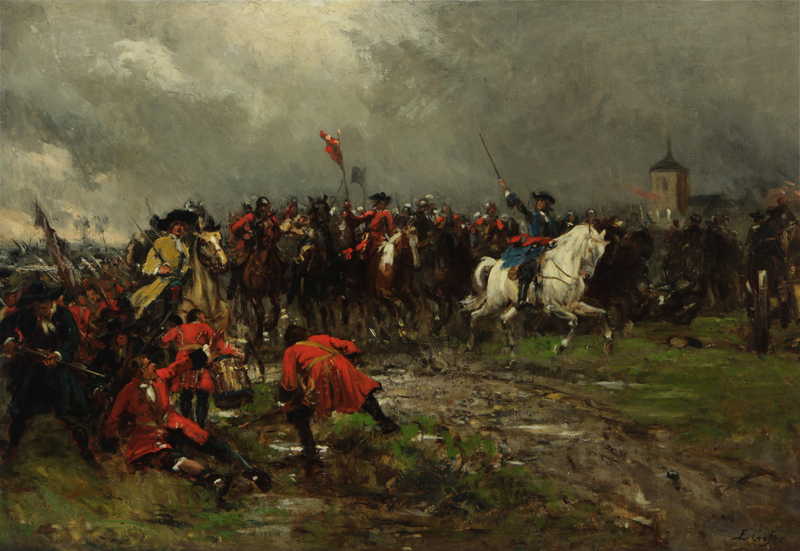 Crofts’ military paintings continue to be used today to illustrate history and military books.